The RivieraWaves Wi-Fi IP family is a comprehensive suite of IPs and platforms for embedding Wi-Fi 802.11a/b/g/n (Wi-Fi 4), 802.11ac (Wi-Fi 5) or 802.11ax (Wi-Fi 6) into SoC/ASSP. Together with the Bluetooth IP family – both low energy (BLE) and dual mode (BTDM) versions ­– the Wi-Fi IP family forms part of CEVA’s popular and production-proven RivieraWaves Wireless Connectivity portfolio. Each RivieraWaves Wi-Fi solution incorporates PHY modem functions and MAC functions, including Lower MAC (LMAC) and Full MAC software protocol stacks. The IP is provided with an integration-ready processor and operating-system- agnostic platform, simplifying deployment in SoC/ASSP designs. An optimized Wi-Fi & Bluetooth coexistence interface with a Packet Traffic Arbiter is also available for smooth simultaneous operation. The modem can be either a hardwired function (for minimal die area and extremely low power consumption) or a software-defined modem (SDM) that gives extra flexibility for multi-protocol connected devices. RF partners including Catena, Sabertek, and others help address deployment on various foundries and processes. Wi-Fi Low Power: optimized for small, low cost and low power IoT devices, wearables, medical, low end smartphones and wireless audio, it includes 802.11n 1×1 (Wi-Fi 4) and 802.11ax 1×1 20MHz (Wi-Fi 6) configurations. 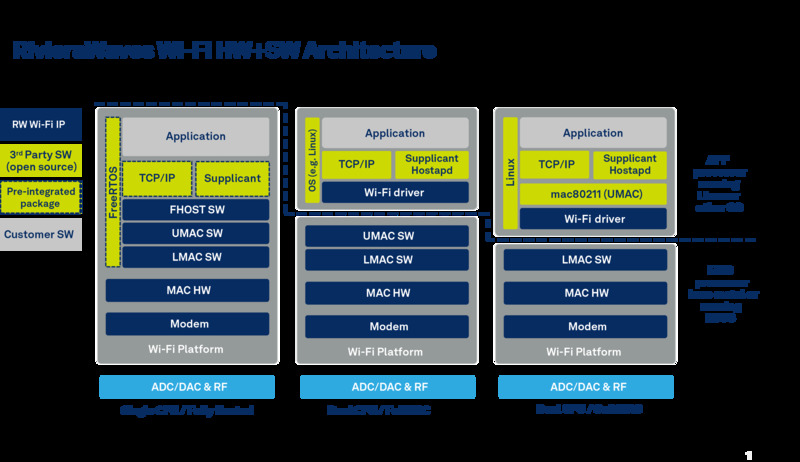 Wi-Fi High Performance: addressing a vast array of media-sharing consumer devices, including smartphones, tablets, cameras, and smart-home products, it supports configurations such as 802.11n 2×2 (Wi-Fi 4), 802.11ac 1×1 & 2×2 (Wi-Fi 5), 802.11ax 1×1 & 2×2 (Wi-Fi 6). Wi-Fi Multi-Gig: tailored for advanced products dealing with high data traffic including access points, media gateways, and Wi-Fi offload in small cells, it provides 4×4 configurations of 802.11ac (Wi-Fi 5) and 802.11ax (Wi-Fi 6). The RivieraWaves Wi-Fi IP family offers designers a choice of small footprint, ultra-low power consumption, high bandwidth, and high performance solutions. Optimized implementations are available that target a broad range of connected devices, including smartphones, wearables, smart-home, consumer & industrial IoT, and automotive applications. The IEEE’s next-generation 802.11ax Wi-Fi specifications are more than a year from ratification, but (as usual) several wireless-chip vendors have already announced pre-standard products.